This project was delivered as a critical component of The Happenstance; Scotland's contribution to the Venice Architecture Biennale 2018. The design of The Armature was intended to test ideas about the role of design in facilitating people’s agency within public space. We are interested in what constitutes successful public space and how to enact design that suggests rather than dictates behaviour. With The Armature project, the key to the successful application of the armature was the collaborative relationship between ourselves and the Lead artists and curators of The Happenstance project; Wave Particle. 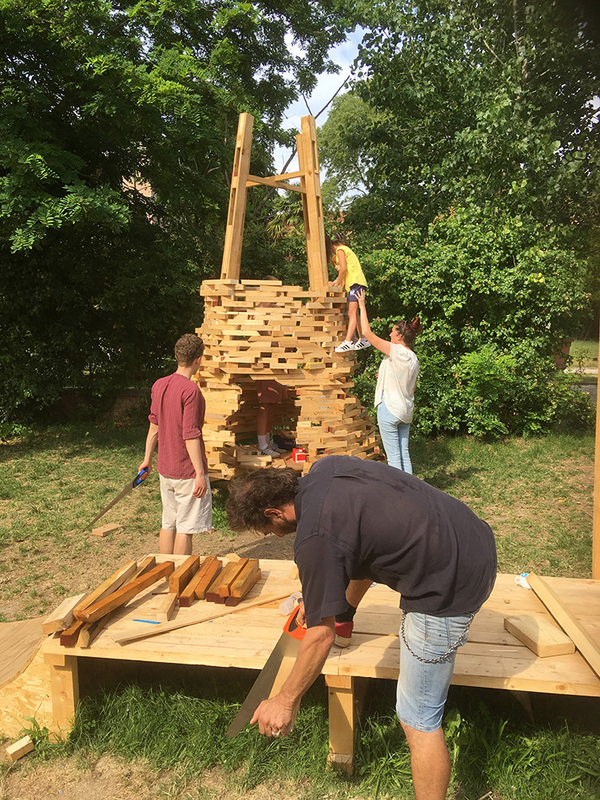 They 'anti-curated' a team of artists and architects from Scotland to act as the spark that would ignite the activity within the space and structure that we created in the garden. Our intention was to provide a meaningful resource to local Venetian people rather than concentrate on delivering a static ‘exhibition’ aimed at the Biennale audience. A resource in the form of place but also a resource in the form of people. As a result, a formerly under used and difficult to access private green space in Venice has become a unique public space that has been utilised by local families and Venetian organisations in multiple ways. The armature creates a space for cinema/performance, a space for play and a space for making along with the 'tools' and material with which to occupy and interpret those spaces. The armature also acts as an enclosed route to provide sanctuary and connectivity between these spaces and other areas within the gardens of Palazzo Zenobio. The way that local people and groups have taken up the invitation provided by the project has been truly humbling and inspiring. The armature has hosted film screenings, a music festival, a Mexican themed evening, community meetings, activist groups, local schools, and every day is visited by local families seeking a place to be playful. 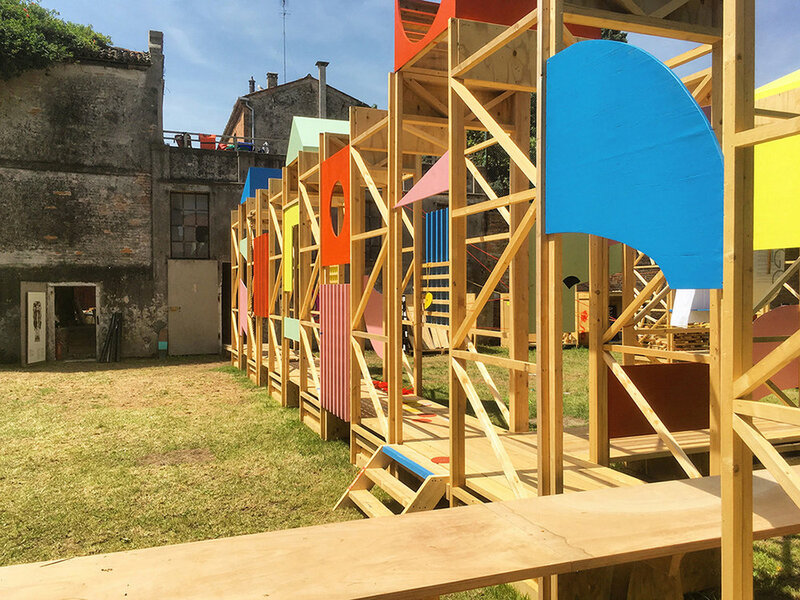 The project has become a freespace in every sense of the word and provided something meaningful and useful to local people within the context of the biennale; which often creates a kind of noise that many ordinary venetians are not interested in hearing. The visual language is heavily inspired by Venice. It is a meaningful response to the physical, spatial and existing activity of the site and to a vernacular application of temporary structures in Venice: the altane, sets, and colours used during carnival, the passerelle; (walkways that are brought out during the flooding). We utilised timber and simple methods of assembly to permit participation in its construction and to encourage replication and adaption beyond our involvement. From the outset people really engaged with the structure in a multitude of ways; they touched it, climbed it, cycled through it, sat on it, swung off it etc. As a resource it quickly became precious but as an object it was always intended to be quite the opposite.